Place all contents in zippered baggie, make a cute label, attach to baggie. 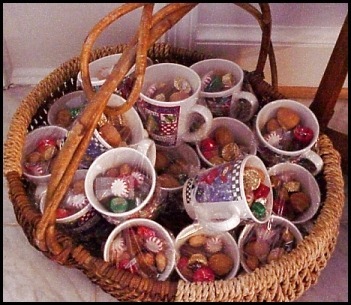 OR: Place all baggie contents in a Christmas Mug and decorate with tull or cellophane wrap. Click here for 1 Snowman Poem, click here for another. Instructions: Use 1/4 to 1/3 cup of mix to 1 cup hot water. features like what is purchased from Itunes. What a lovely, easy and economical gift this is! Compile a document on your PC of all of your favorite inspirational sayings. To get an idea of the size, fold a piece of 8 x 11 1/2 printer paper in half, lengthwise and then fold into thirds. You should have 6 sections. Line up your text on a page in that manner. Use pretty fonts. Print out sheets front and back, cut each page into 6's, compile and use a hole punch and ties together with a pretty ribbon. Hand sign the booklet to your friends. Get a HAMMER, a hard, flat surface and a towel. Gently beat the round part of the spoon. Flatten it. You've just created a really nice silver cheese spreader! Tie a red ribbon around the neck of spoon. Give as it is with a little note attached or make some homemade cheese spread to go with spoon! 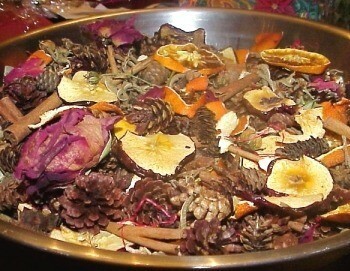 In 2000, I gave homemade pot pourri to my guests as a parting gift. a pipe cleaner to keep it closed. *** Don't throw your tin cans in the recycler! 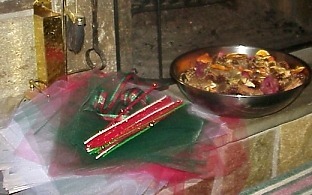 Use the cans for candles and votives! Use all sizes of cans for different uses... tuna cans, soup cans... you can spray paint the cans or brush pain them. Use, beads, glitter or if you're really artistic paint holiday designs on them. Also, the tin cans can easily be punched with an sharp tool like an ice pick (Be careful! Wear Heavy Duty gloves) then the light from the flame will shine through. Easy, beautiful and CHEAP! Take pine cones that you gathered from your yard. Stick a florist wire around the top and make a loop to hang on tree. Spread peanut butter on the cone, then roll the cones in bird seed, make a wonderful winter treat for your feathered friends. Do you have boxes full of old Christmas cards laying around? Get out your pinking shears or Creative Memories scissors and start cutting in to easy shapes, like stars, hearts, circles, and rectangles. Package in cello, in groups of 8 or 10. Tie with a pretty ribbon. Homemade Christmas Ornaments commemorating your party with date.